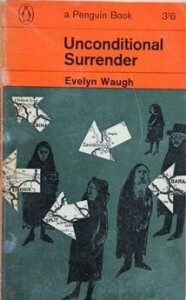 In January, a small cohort of the Book Group met to discuss the last book in Waugh’s “Sword of Honour” trilogy: Unconditional Surrender, which appeared for the first time in 1961. It nearly did not appear at all; Waugh struggled with its writing, and at one point it looked as if Officers and Gentlemen (1955) would be the last we heard of Guy Crouchback, Virginia Troy and Brigadier Hook. ‘Angela,’ Virginia said … ‘Couldn’t you take that baby down with you? Old Nanny would look after it, surely’? I thought it more ironical that there should be real heirs of the blessed Gervase Crouchback disposessed by Trimmer but I plainly failed to make that clear. So no nippers for Guy and Domenica in Penguin. This intention, perhaps, makes it clearer why the narrative appears to sympathise with Virginia’s attempts to terminate the pregnancy. We otherwise found this aspect of the text hard to square with Waugh’s Catholicism, though in life too Waugh did not judge friends of his (such as Mary Lygon) who found themselves in a similar predicament. 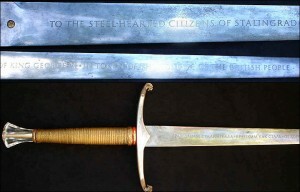 The Sword of Stalingrad is one of the swords referenced in the trilogy’s title. In Waugh’s infamous Face-to-Face interview, he pointed out to John Freeman that there was still goodness in a decadent world. 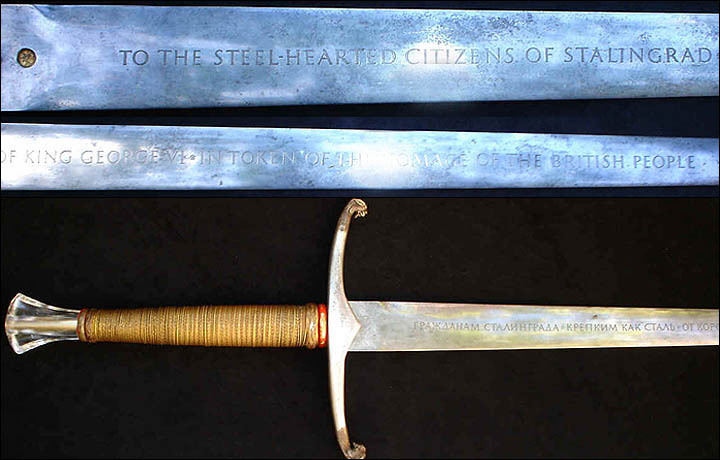 In the world of “Sword of Honour” was the ‘blessed Gervase Crouchback’. Guy’s father dies without a fuss in Unconditional Surrender, oblivious to the last of the ill-wishers who surround him. Guy’s amoral brother-in-law, Tony Box-Bender, is shocked to see the church so full at his funeral. There are some remarkable set-pieces of writing in this text, which show Waugh at his surreal best. A plane crash, closely modelled on a wartime experience of Waugh’s, conveys something of the other-worldliness of trauma that recalls the nightmare landscape of Crete in Officers and Gentlemen. The sinister Major Ludovic falls apart completely when confronted once again with Guy, finding solace in a dog he names Fido – after an officer he has murdered. The fact that Guy and Ludovic are never seen together in this novel – Ludovic goes to extreme lengths to avoid him – made us wonder if he might function as a kind of doppelganger for our protagonist; Guy’s moral conduct in the war is close to impeccable, so perhaps Ludovic functions as a kind of repository for his evil impulses. He is a writer, after all. In 2014, The Daily Telegraph listed the Sword of Honour trilogy amongst its best war and history books of all time. Does it deserve this accolade? Well, I’d probably have to read a lot more war and history books to be sure, but there’s a good chance they’re right. Perhaps more than anything else this trilogy represents WWII not as a singularity but as a dominant, fickle force on his character’s already existing lives. For sheer kaleidoscopic breadth, it would take some beating.